As we live in Portland, we spend a lot of time in the Northern part of our state. Oregon is a pretty big place and it takes some time to travel to other areas. You can figure, going from west to east starting at the Coast, will take you 6+ hours to get to our shared boarder with Idaho. If you were to start at the Oregon/Washington border and drove to the Oregon/California border, the fastest route would get you there in about 5.5 hours. It is really important to me that I show my son all of Oregon. Portland happens to be in Oregon, but Portland is Portland. The rest of Oregon is so, so different! 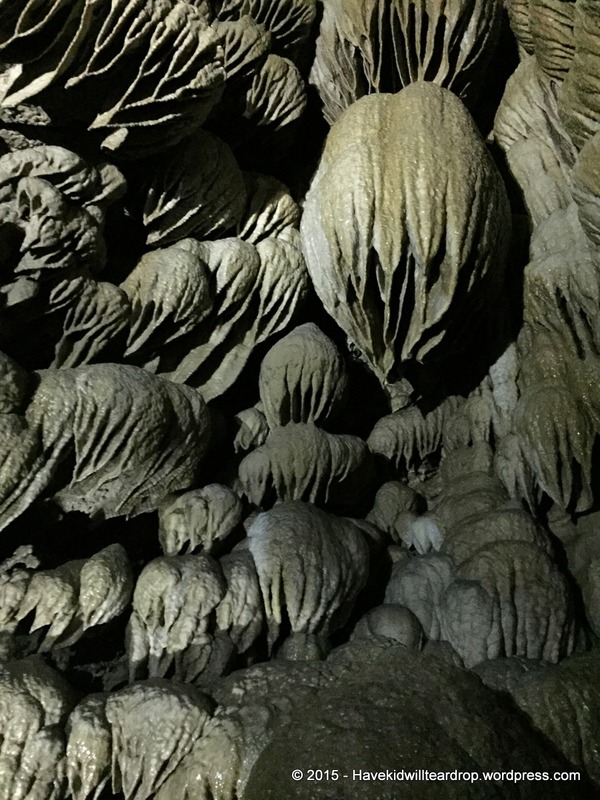 There are a few places that I have wanted to visit too, and one of my main goals this summer was to get to the Oregon Caves. That meant a tour of the Southwestern part of our great state! We headed south on I-5. After a quick pit-stop in Eugene to visit my family, we continued our journey south, making a stop in Winston, Oregon. Winston is just south of Roseburg and home to Wildlife Safari. We used to visit when I was child and they continue to be a big draw for families from all over the world! They estimate more than 150,000 people come to the park to have a look at their inhabitants each year. The parks main focus is conversation of animals and education for all of us humans. It is the only drive through animal park in Oregon, and gives you an up close look at various animal species. This is such a special place where you can see elephants, lions, tigers, bears, and cheetahs roaming around their large enclosures. Wildlife Safari is home to one of the most successful cheetah breeding programs in the nation. 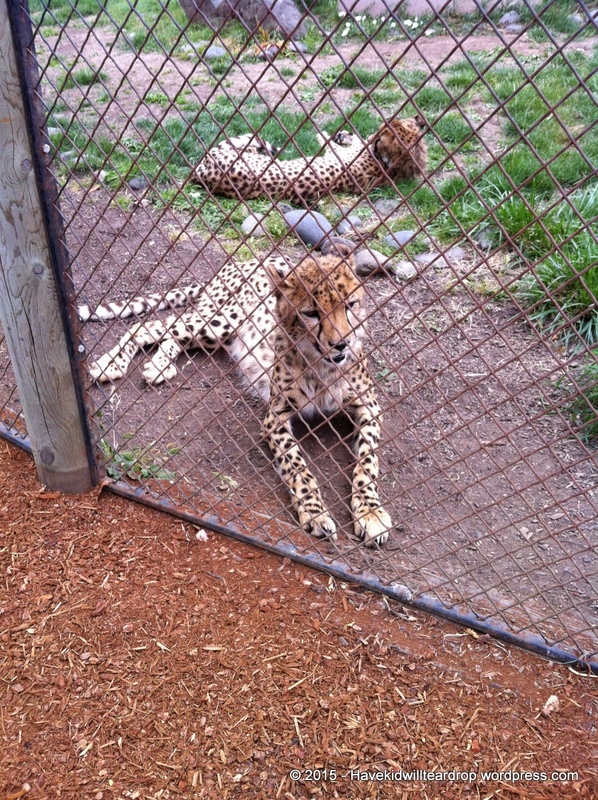 You will get to see the baby cheetahs in the “day enclosure”. While we were there, we saw a baby cheetah and her best buddy. Usually cheetahs are born as sets of twins, but her twin didn’t make it so her best friend and companion is a puppy who is about the same age. The pup was similar in size and they have bonded and spend their days together. The only time they are separated is during feeding times. 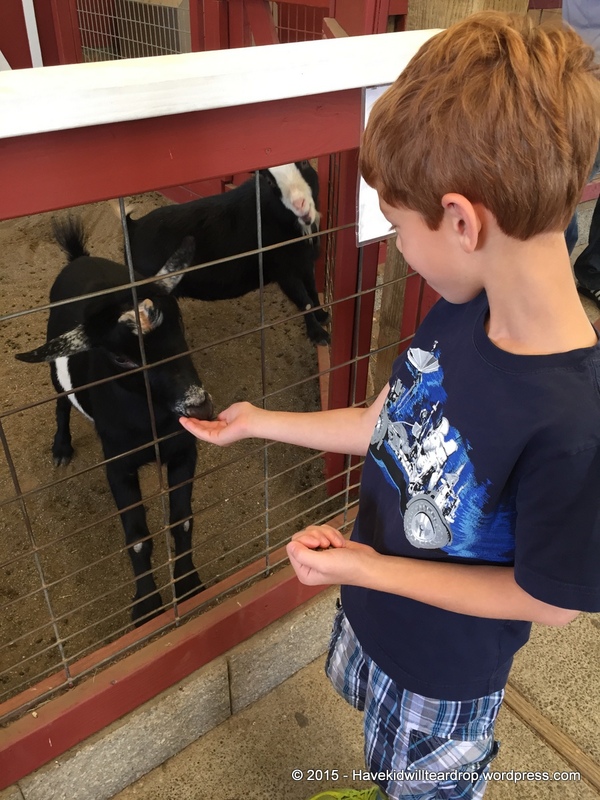 Wildlife Safari also has a petting zoo portion where kids can learn about goats and cows. There are reptiles and birds, and a train to ride around as well. In the past they did Elephant rides, but that no longer happens and they now offer camel rides instead. There is also an education center where they teach folks about different animals and about conservation of those animals. In addition they offer up close encounters with a few of the large animals for a fee. We went out and spent time with the elephants, which was an amazing experience. When I was a child I did an elephant ride and many of these elephants are the same as the ones who were there when I was a child. Wildlife Safari is a really excellent day out and a lot of fun for kids of all ages. Parents really love it too, and we highly recommend checking it out! There is also a campground just outside the park. When we get back down again, we might give that a go. We have dragged our little teardrop through the park twice now. I sure wish I could have a picture of that, but you are not allowed to get out of your car (for safety reasons). After we spent a nice day here, we headed further south and stopped in at Valley of the Rogue State Park for the night. We have stayed here before, and while it isn’t our favorite State Park, it is very convenient and the hosts are great. The next day we got up early to head to the Oregon Caves. The night before the camp hosts gave us some info about the fires that were raging in the area we were heading towards, which was very helpful, as roads were closed the day we arrived. That had us a bit worried at first and we checked the roads before setting out. The next morning we learned the roads had reopened, and we could in fact go. We were relieved! 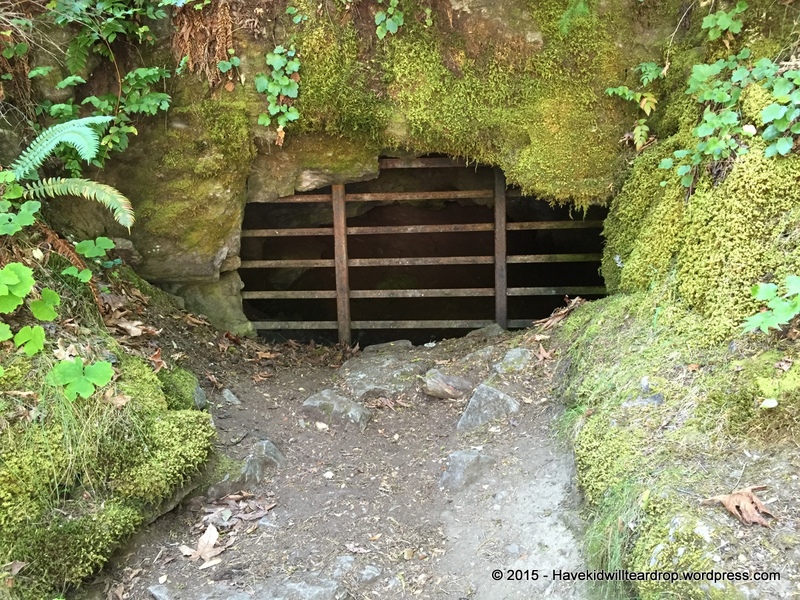 We hopped in the car, passed through Grants Pass and headed down the highway towards Cave Junction, cutting over from there to the Oregon Caves National Monument. If you are hauling a trailer or traveling in an RV, make sure you check the vehicle length allowed on the road up. We were under the limit, but the road is very narrow with very tight curves and there is nowhere for you to turn around if you can’t make it up. The parking spots at the Caves are not ideal for long vehicles or trailers either. My truck and trailer only just fit in the spot and you have to parallel park. All of that said, the Oregon Caves are completely amazing and did not disappoint in the slightest. When you first get there you will want to check in at the Ranger Office to get your tour time reserved and pay your fee. We got there around 8:00a, and had just missed the first tour, but got in on the 8:30 tour. They run them frequently but during the busy season (summer) the wait for a tour can be up to 2 hours. Kids have to be at least 42″ tall to go on the tour, and they are strict about this for safety reasons. There are lots of steps that will need to be climbed and the National Parks calls this a “moderately strenuous” walk due to that and the occasional “hunch walk” you have to do. My 8-year old had no trouble at all, and neither did I. Regardless of height, there are lots of things for kids of all ages to do in the area! Legend has it that pioneer, Elijah Davidson, was out hunting in 1874 when his favorite dog Bruno ran off and into the the cave entrance (pictured right) in pursuit of a bear. Elijah followed his dog into the cave in an attempt to bring him home and save him from the bear they were chasing. Elijah had very few supplies with him and was not prepared to go into the cave for an extended period of time. He became lost and used all of the matches he had with him. He kept his wits about him and listened for the stream that flows through the cave, figuring out which way it was heading and thinking that would lead to the way out. Historians figure he was in there for 6-8 hours working his way back to the outside world and his dog was rescued too. The stream still flows through the cave and helps to create the environment you will pass through. After that several people visited the caves, and then tours went into operation. 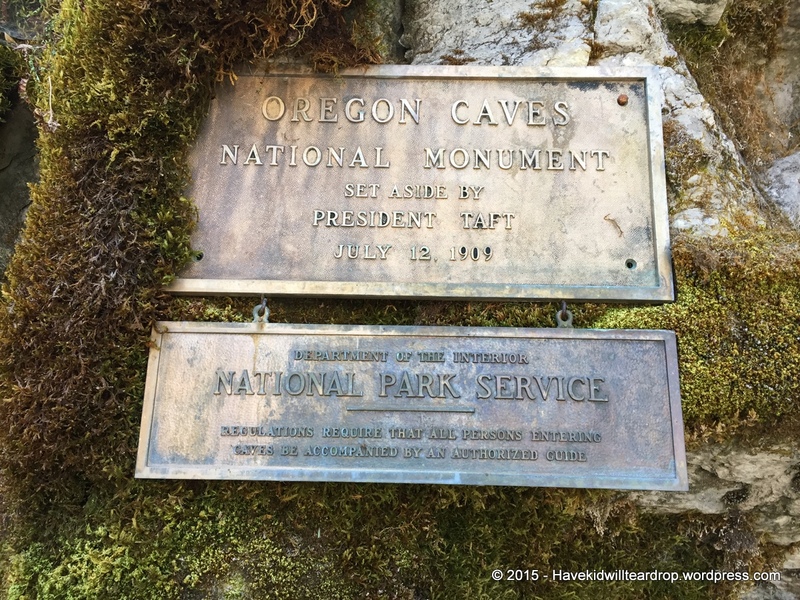 The Oregon Caves was deemed a National Monument by President Taft on 21 July 1909. When you head into the cave make sure you have good shoes that will provide proper traction and bring a jacket. It is chilly in there, even in the summer time. Bags are not allowed, and they do their very best to protect the cave as much as possible. Most people don’t think of a cave as a living thing, but it really is. Humidity, moisture, and oils from our hair and skin along with the fibers from our clothes can completely change the environment of the cave. This is one of the most spectacular caves I have been in and I would hate to see it change due to human interaction, so please be respectful of the rules. We want to keep it wonderful for future generations to see! Also, please help us protect our bat population and be honest about whether you have been in caves in the Eastern part of the US. White-nose syndrome has not made it to Oregon yet, and we are trying to delay it’s arrival. The tour is lead by a ranger and will cost $10 per person. The tour will take you on an 90-minute adventure through the caves and the various “rooms” where your Ranger Guide will explain the history and different formations you will see. The caves are made up of marble, which is very unique. You will also get to see fossils, learn that different animals in history used the cave (not just the bear from Elijah’s story, but they have also found jaguars), and you will learn how all of the stalactites and stalagmites form and how quickly (or slowly as the case may be!). It is a really awesome tour and Laddy wasn’t bored once! If kids are scared, there is a turn-back point 45-minutes into the tour and the Ranger will point that out. Once the tour was done, we worked on the Junior Ranger bo oklet so the Lad could become a Junior Ranger at the Oregon Caves and then headed to the Chateau for a bite of lunch. The Chateau is an amazing and beautiful building, crafted with such care that when a land slide pushed it off it’s foundation in the 1960s, it was so structurally sound they were able to pick it up and put it back onto the same foundation with very few repairs. One thing I loved was being downstairs in the cafe and having lunch. It is like stepping back in time to an old soda fountain. The napkin holders are straight out of the 50s and they serve a really delicious milkshake and big burgers! There is another restaurant down there as well and a gift shop. 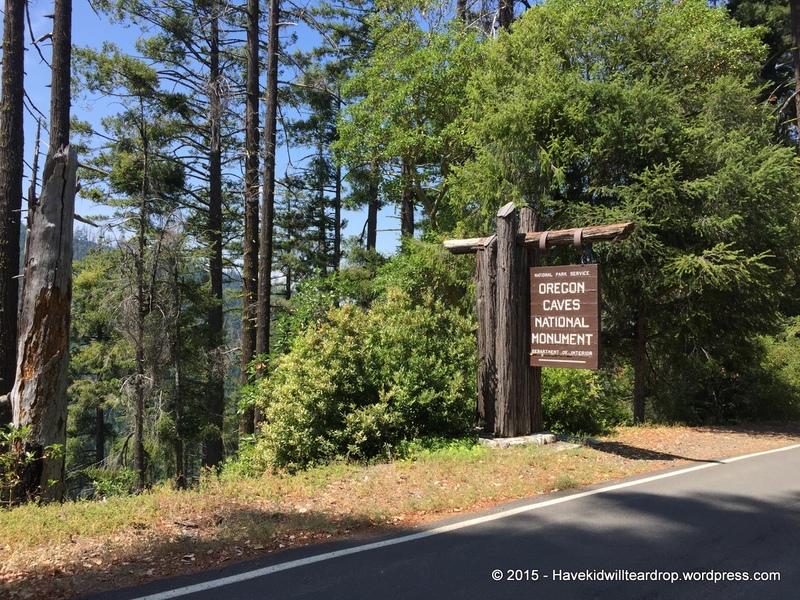 It is one of Oregon’s historic landmarks and the employees are very friendly! If you would like to stay at the Oregon Caves, reservations at the Chateau are available. As for camping, there are campgrounds at the start of the road up to the caves, but from what we saw, they get pretty packed and are on a first come/first serve basis. We decided to head over to the coast to get some fresh air (away from the fires) and cooler temperatures. With full bellies, we loaded up and drove the rest of the highway, into California through Jedediah Smith State Park and then back into Oregon for a night at Harris Beach State Park. 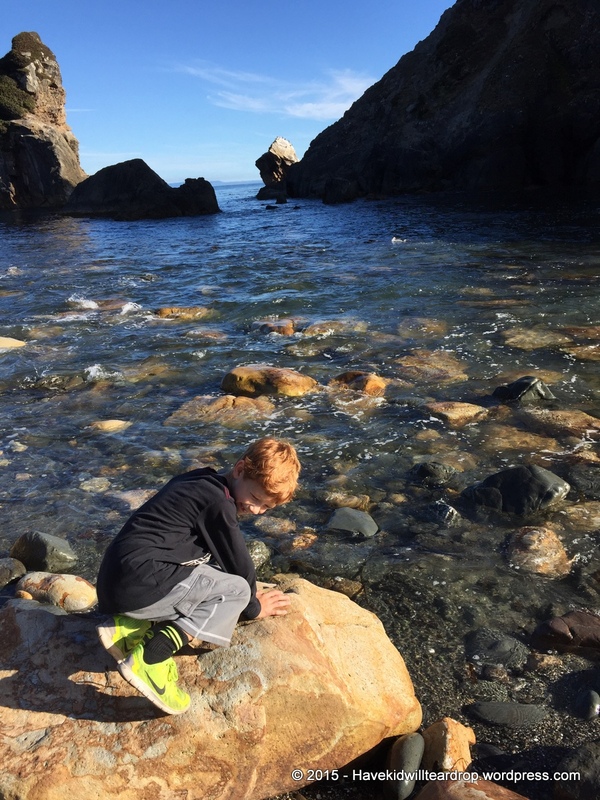 We really like Harris Beach State Park and it is always a great place to say. This year it was more ideal as forest fires were an issue near Jedediah State Park. We saw base camps for fire fighters full of people and the air full of smoke. In the future, I want to stay there, but this was not a good year for it. There are amazing Redwoods in this area, and the river running through to the Pacific was gorgeous. Harris Beach was a good option for us to rest our lungs and to get the smell of smoke out of our hair. Plus, it was warm and the water cool, with a lovely breeze and it is such a great campground for kids. We had a relaxing evening here, before starting our journey north! After a night relaxing at Harris Beach we loaded up and started our journey north. Our first stop on the way north was the Prehistoric Garden. We stopped here years ago when my son was 4. He wasn’t overly excited about it back then, but I was thinking with him being a little older on this trip and the fact we were meeting up with one of his friends it would be be more fun for him. It wasn’t. I think for kids who really like dinosaurs or people who want to check out some big beautiful plants in a rain forest setting, this might be a stop you should make. It can be expensive if your kid is basically using the path as a track and not taking in any of what they are trying to teach. I really wanted him to like it, but it just wasn’t happening. It is a beautiful walk though and if I had been on my own I would have spent more time having a look at signs and enjoying the environment. The life size dinosaur statues are incredible. From there we drove north to Port Orford for lunch. We popped into a tiny little restaurant called Griff’s on the Dock. It is an amazing place to go for fresh seafood lunch. We had fish and chips and came away with full happy tummies. Their desserts are home made and after lunch we took a walk around the dock where boats were being launched or trailered. It was really interesting for the boys to watch this fishing dock in action. After our fun with friends we continued our drive north and dropped anchor at Jessie M. Honeyman State Park in Florence. This part of the coast is near and dear to my heart. As a young Girl Scout I used to go to summer camp at the nearby Camp Cleawox and swam in the lake there. I wanted to show that to my son. Our camp site was small, but near the playground which was very nice and my son really liked it. It is a very busy campground and our spot was tiny, but worked just fine for us. We did not have any sort of hook ups there which worked fine for us. There is biking in the area as well as paddling (wish we had time to get out the paddle board and kayak), hiking, and a variety of other activities. The thing we were most excited about was going on a Dune Buggy ride the next morning! I called up Sandland Adventures and booked our Dune Buggy tour. We decided on the half hour Sandrail Tour, which was a really fast ride through the Oregon Dunes National Recreation Area. A section of the Recreation Area is protected from OHVs but there is land available for folks who want to go out and experience the land this way and that is where the tours take you. Our driver was an expert as well as a tour guide and told us about the land we were going over and explained how things had changed. While we were underway it was like riding a roller coaster going up one side of a dune and down the other, wheel spins and crazy turns where the back end broke loose. They do have a tamer version where the Giant Dune Buggy goes out and does a slower tour of the dunes with a few up and downs. We highly recommend checking these tours out! There was sand everywhere but this was such a fun way to end our camping adventure. From here we ventured back to the valley and home and started planning our next trip!